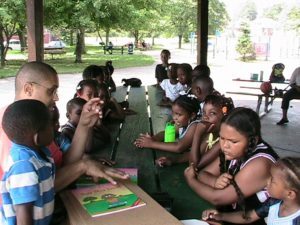 The North End Youth Improvement Council, NEYIC, operates its summer program at Delores Bennett Park, located in the shadow of Detroit's New Center area corner of Smith & Beaubien. Our Summer Program provides over 8 weeks of scheduled activities: Monday thru Friday 8:00am to 5:00pm and Volunteer Day on Saturday from 10:00am to 6:00pm. Open registration for Summer activities start in June. We establish group and individual sessions, along with many other activities to direct and assist in youth development and family support. Sessions are create d to specialize in peaceful conflict resolution, career development, self- importance and community pride. Other activities provide, Out of Neighborhood Opportunities and tutoring. The field trips are selected to expose children to positive and different surroundings, provide interest in positive life options and self-achievement. Supervised daily leisure activities are developed to promote safe play, and proper social skills. During the summer months Mentoring Sessions and Group Sessions are scheduled twice daily. These sessions included workshops, speakers, rap groups, as well as individual conferences. Session topics include peaceful conflict resolutions, drug awareness, good-listeners / good-friends, Career Development, Positive Self, Drug Awareness and Community Pride.